The NLC permit system is designed to help protect the privacy of Aboriginal communities, preserve Aboriginal culture, safeguard the natural environment and promote visitor safety. Please read the Frequently Asked Questions before completing and submitting the form. 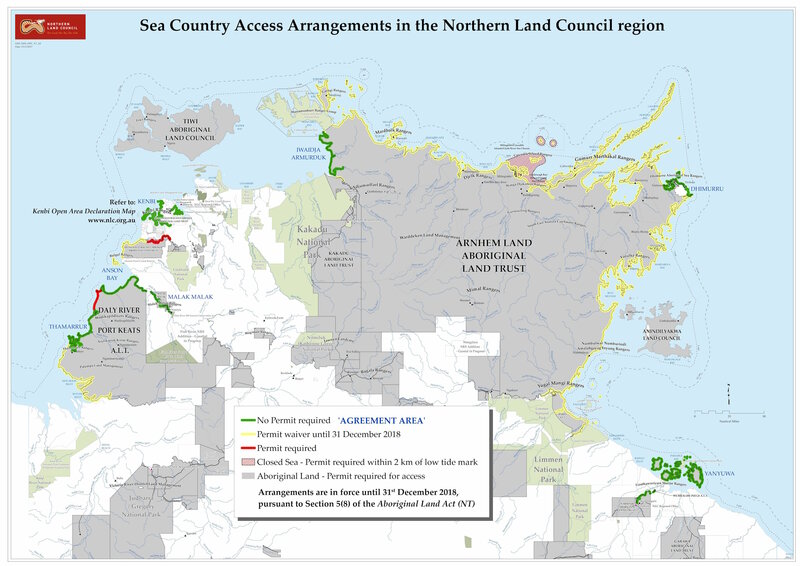 Download the NLC Sea Country Access Arrangements Map to see where permitted access areas are and where a permit is required. Read the Information Sheet on Access to Tidal Waters on Aboriginal Land for more information. Dhimurru is an incorporated Aboriginal organisation established by Yolngu traditional Aboriginal owners in north east Arnhem Land, Australia. Yolngu have agreed for visitors to safely enjoy the 20 designated recreational areas within the Indigenous Protected Area in a sustainable way. Permits: Visitors wishing to visit the recreational areas must firstly obtain a permit from Dhimurru Aboriginal Corporation. Specific permit information and applications can be completed online at www.dhimurru.com.au or in person at the Dhimurru office in Nhulunbuy. Phone enquiries should be directed to (08) 89392 700.